Principles of Ayurveda, the Elements and the Doshas. Psychological and physical profiles of the Doshas. Chakras, their physiological, emotional and psychological correlates. Asanas and their effect on the Chakras. Numerology and the 10 bodies divination and diagnosis. The 10 body model: Description. How they function in health and disharmony. Directed by Guru Dharam and an exceptional team of Teacher/Healers, the course is delivered as intensive stand alone modules all comprised of fascinating yogic science, philosophy, information and direct experience of holistic healing. The sacred science of Kundalini Yoga demystified and presented for you to apply therapeutically one to one as Medicine for the 21st century. The series is designed for yoga teachers from all traditions, alternative therapists, counselors, energy healers, paramedics, medical personnel and anyone who wants to understand the mechanics of Kundalini Yoga more deeply. *Each module is complete so that you can attend them in any order you choose. The course is certified by Kundalini Medicine. *The entire training consists of 7 modules and is an 800 hour course including 100 hours of anatomy and physiology and practicum. We have applied to register the program with the International Association of Yoga Therapists IAYT. To withdraw from the course we must receive your request in writing before the start date of each Module. You will be eligible for a refund minus a non-refundable $300 up until the first day of each Module. No refunds will be given once the first day of each Module has begun. **contact Alli Hutchins | ananddeepkaur@gmail.com to hold your place. Guru Dharam Singh Khalsa, BAcC RCHM guru dharamGuru Dharam started KundaliniMedicine in 2007. He has an international Healing and Yoga practice, and has been teaching for over 25 years. As a Keynote speaker on matters of health, vitality, emotional intelligence for Association of Chief Executives in the UK, 2002-2005, Guru Dharam served as an educator to the business and corporate community. He has taught Kundalini yoga since 1980 and been practising Oriental medicine since 1988 when he founded the Lotus Healing Centre, London, and served as the Vice Principal of the London Academy of Oriental Medicine. Guru Dharam founded the International School of Kundalini Yoga in the UK in 1996, (with Darryl O’Keeffe, his co-author of “Kundalini the Essence of Yoga,”) teaching people to become yoga teachers. He lead training courses in Sweden, UK, Germany, Ireland, Israel, New York, and Malaysia. Guru Dharam is also the course Director of the International Kundalini Therapy Training held in Sweden. and an associate Director of the Institute of Medical Yoga, Stockholm. He trains yoga teachers and healthcare professionals to apply the principles of Kundalini Yoga and Meditation in a therapeutic context for challenging modern conditions. For example he has developed programmes for anti stress burn out and attention deficit disorder. 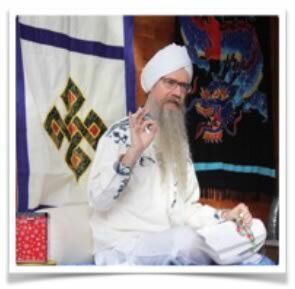 In addition to his practices in Kundalini Yoga and Yoga Therapy, Guru Dharam is also a qualified practitioner of traditional Chinese Medicine and Chinese Herbal Medicine, Internal Feng Shui, Numerology, Dream Teaching, and Red Thread Empowerment.